The diagram illustrates the design process in practice at the digital design studio, Collective Experience, entailing 5 phases. Encompasses brand attributes, identifying pain points, competitive and market analysis, user profiling, scope and specifications, and defining goals. Involves user experience, content strategy, information architecture, user interviews, task/user flows, brand positioning. Design phase exercises user interface design, interactive design, responsive design, brand visuals and style guides. 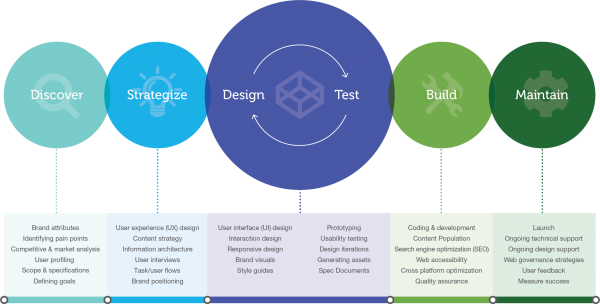 Testing involves prototyping, usability testing, design iterations, generating assets and creating spec documents. Testing and Design both inform each other as a cycle in this phase. Entails coding and development, content population, Search Engine Optimization, web accessibility, cross platform optimization, quality assurance. Encompasses launch, ongoing technical and design support, web governance strategies, user feedback, and measured success.